This may seem like a really simple concept, but if you haven't tried this technique, you may be missing out. 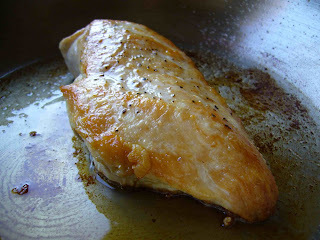 The secret to getting a chicken breast that is still moist when it's done cooking is starting it on the stove and finishing it in the oven. The way I do it is to preheat the oven to 375 and heat a little oil in a small, oven-safe pan (or a large one if you're cooking a lot of breasts). Salt and pepper the chicken and add it to the pan. Brown on one side and flip over. After you turn the chicken over, place the whole pan in the oven. if it's a small piece of chicken you should start checking it after 5 minutes. After you've done this a few times, you'll be able to tell just by touching the chicken if it's done, but if you still need to double check, I find that nothing works quite as well as cutting into the chicken a tiny bit and making sure that pinkness is gone. Enjoy!